Gardening should be fun! 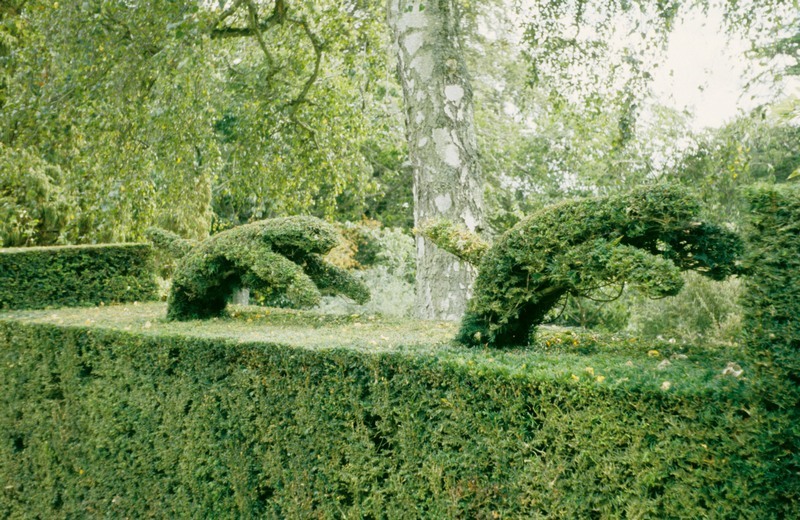 As gardeners, we sometimes take ourselves and our art far too seriously. We worry that our borders aren't in the most fashionable style or that we aren't growing the newest or rarest of plants. 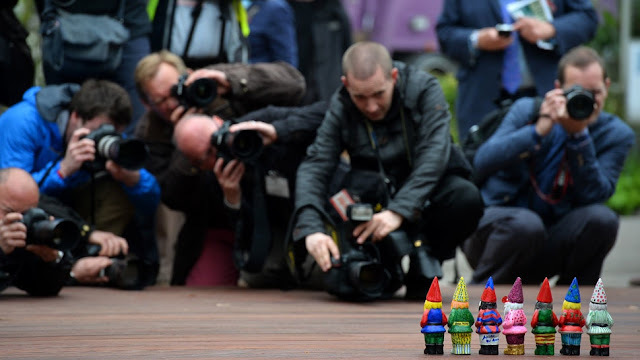 Amazingly, that most revered of horticultural institutions, our beloved RHS, recently relaxed its stays and its draconian show regulations to allow garden gnomes into Chelsea for the first time! A rare opportunity for humour and a valid charity fund-raising exercise. 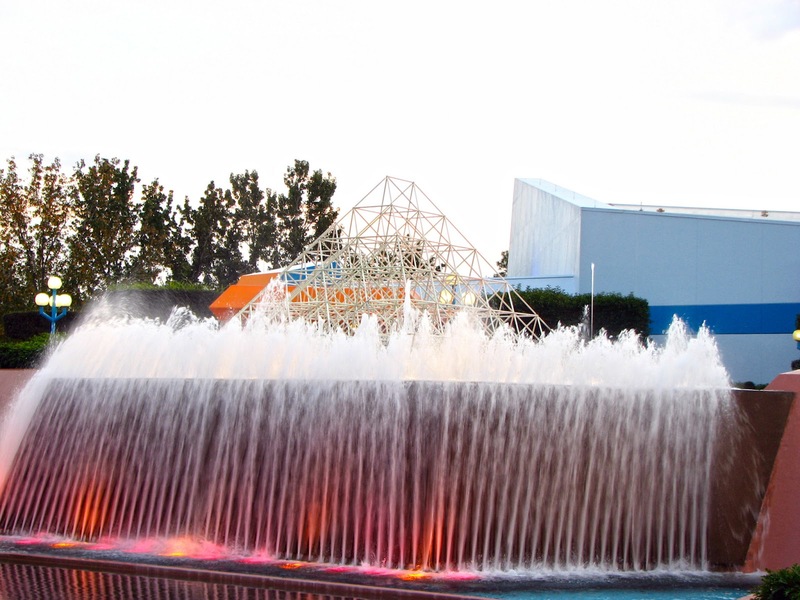 Going back in history, gardens often included a fun element. Henry VIII’s Hampton Court garden, included fountains designed play upon the ladies and 'give them a thorough wetting!’ Maybe the royal sense of humour was a little robust but such water jokes were popular in early gardens. The iconic Victorian garden at Biddulph Grange includes an Egyptian style pyramid of yew guarded by two sphinxes. 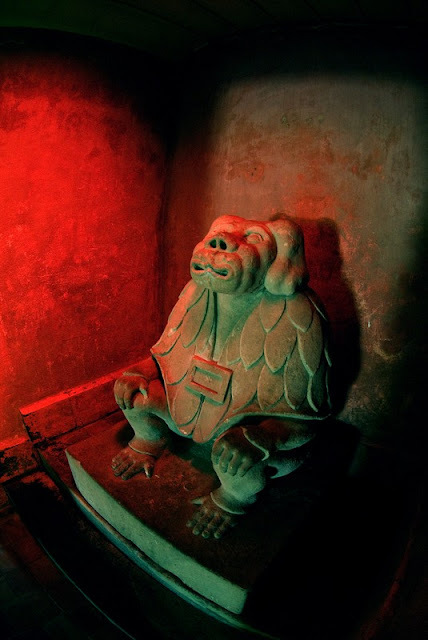 Hidden within the darkened tunnels, is a creepy monkey-like figure, the Ape of Thoth, lit by a red light in a small recess. One can imagine frail Victorian ladies squealing with surprise and delight on finding it! 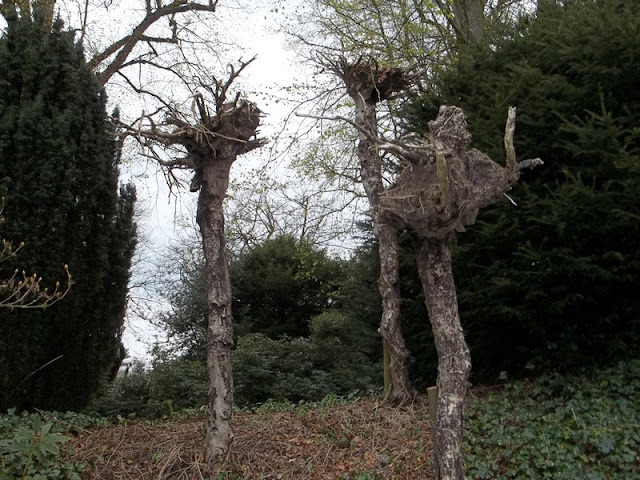 The garden also includes some curious upside down trees with exposed roots - a recreation of an original whimsical feature. Further south, Knightshayes Court, built in the second half of the 19C includes a formal garden with a yew hedge topped with topiary figures of hounds endlessly chasing a fox. Inevitably the various Disney theme parks have their own humour like the Epcot centre in Florida with its quirky upside down waterfall where a sheet of water appears to travel upwards. 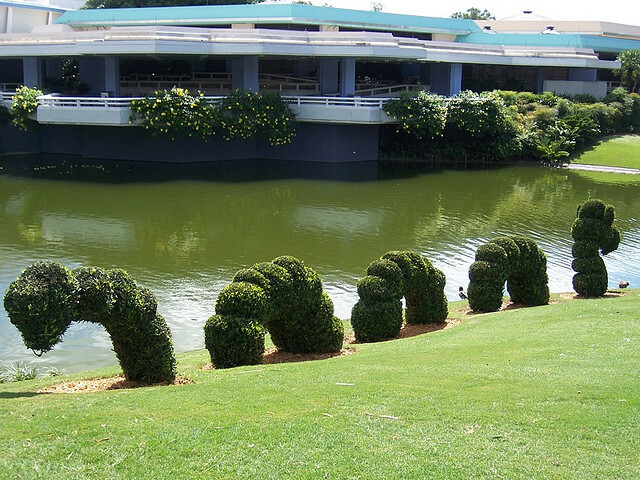 And topiary of course holds endless possibilities. Bedding is generally regarded as unfashionable but each year the Tatton Flower Show attracts many visitors who flock to see the annual flower bed competition. 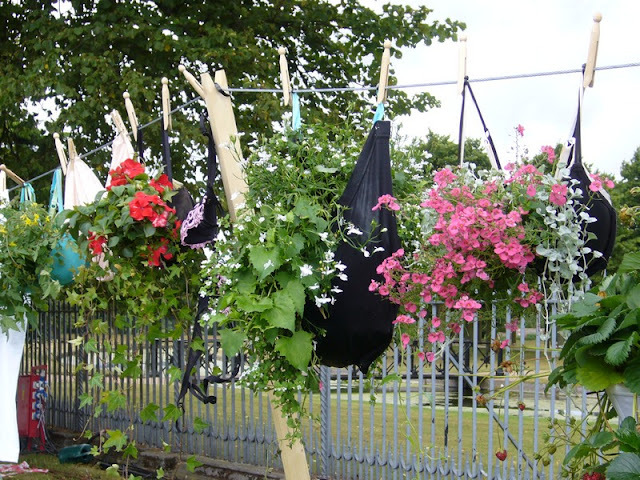 Amongst the entries there are always those with an amusing twist such as the 2008 entry with a sleeping gardener in his bed made from garden tools and tucked up with a quilt of French marigolds. And of course everyone loves Wallace and Grommet! San Diego Botanical Garden in California includes a curious ‘Under the Sea’ landscape ironically planted with drought resistant plants. 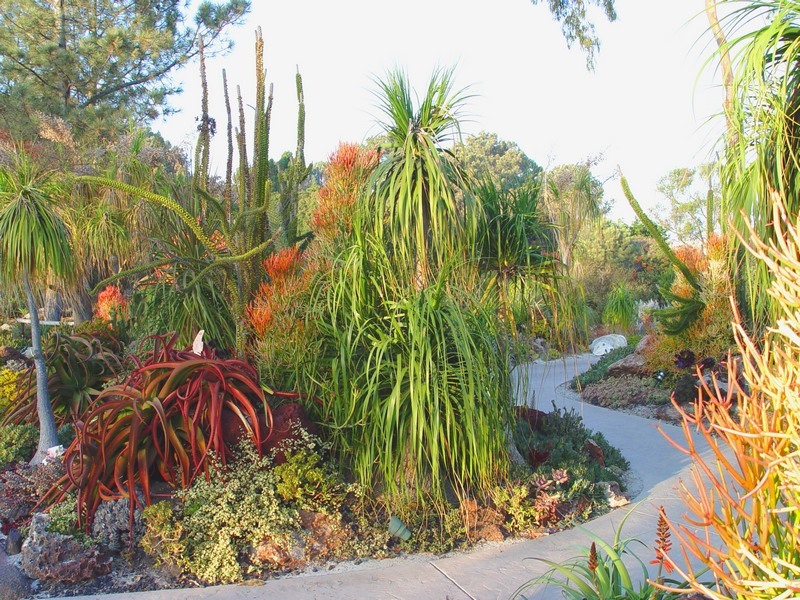 Specimens of the sinuous Aloe vanbalenii, the octopus aloe, feature along with other succulents. Euphorbia tirucalli ‘Sticks on Fire’ glows beautifully in lovely coral red tints. 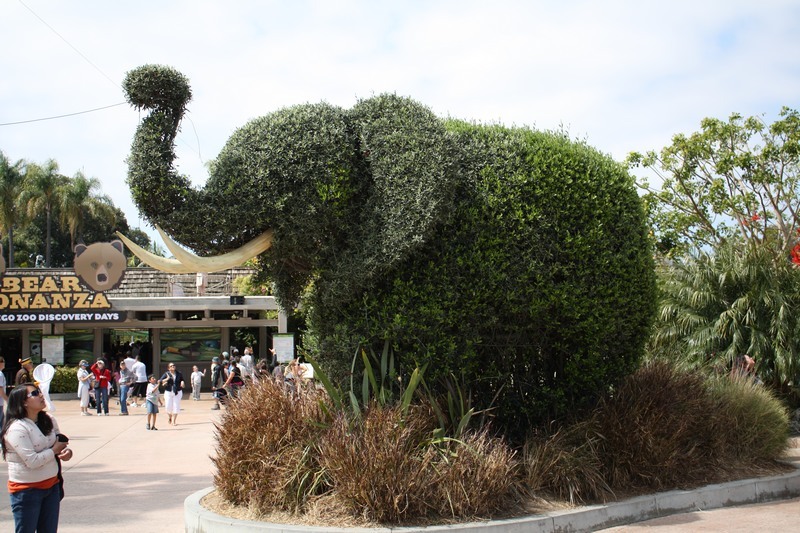 Volcanic stone, fossils, shells, an anchor, a turtle sculpture and other maritime bric-a-brac all contribute to this fascinating theatrical garden.There is also a topiary elephant to greet visitors at the entrance. 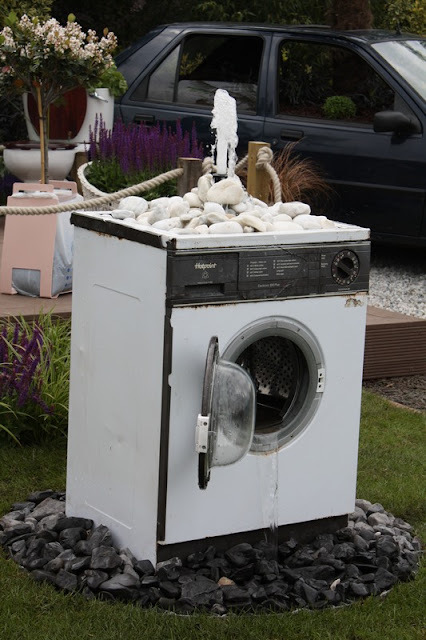 The plasticine garden at the Chelsea Flower Show in 2009 was perhaps very tongue-in-cheek but it is to the credit of the Royal Horticultural Society that they allowed it. 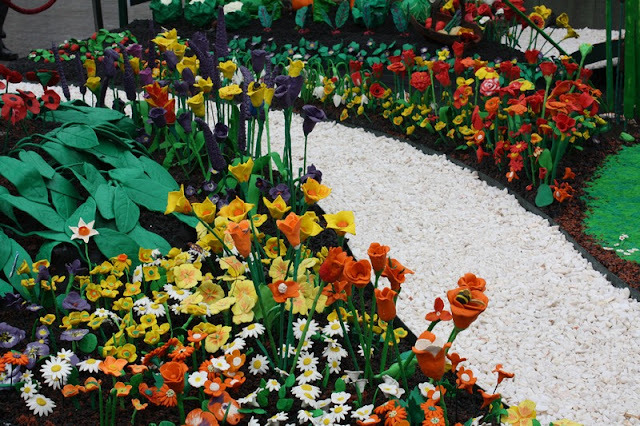 There was no doubting the crafting of the hundreds of brightly coloured flowers, whimsical fruits and vegetables. And to complete the jest, the judges awarded a plasticene medal! A few years back, the Hampton Court Flower Show arranged a washing line, pegged out with planted ‘hanging braskets’ matched by a few pairs of ‘Y fronts’ all discretely overflowing with petunias! 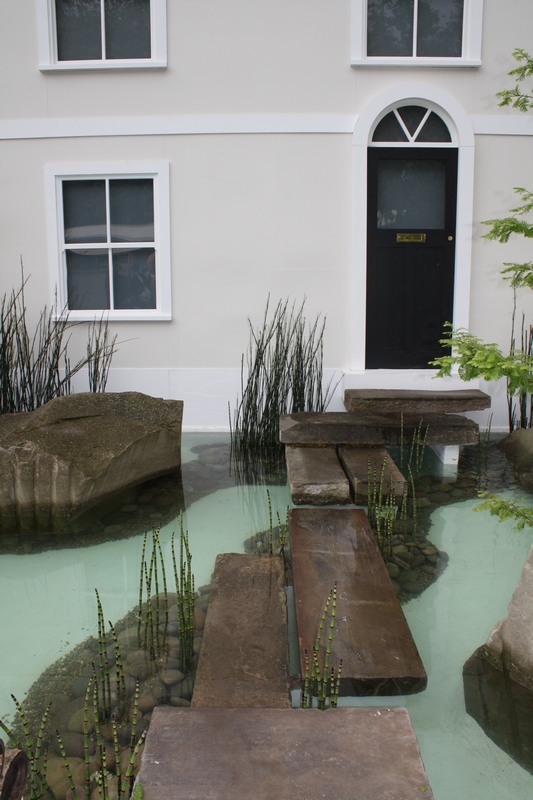 Some years ago Chelsea included a row of front gardens and the one that tickled my own fancy was a wall to wall front garden pond, complete with stepping stones and drawbridge - just the thing to keep away unwanted visitors and I defy the postman to walk all over the planting! Few visitors to Amsterdam know about the secret sculptor who has installed several pieces of artwork across the city since 1989. My own favourite is a small bronze woodcutter perched precariously on a plane tree, sawing away at the branch on which he is standing. It’s quite hard to find amongst a group of plane trees near the Oude Kerk but such fun when you have located it. Rumour suggests the sculptor with the sense of humour is a member of the Dutch Royal Family. In 2009, walking along the Southbank in London, I was astonished to find rows of trees with their trunks wrapped in red fabric with white spots. After the initial shock it inevitably raised a smile. 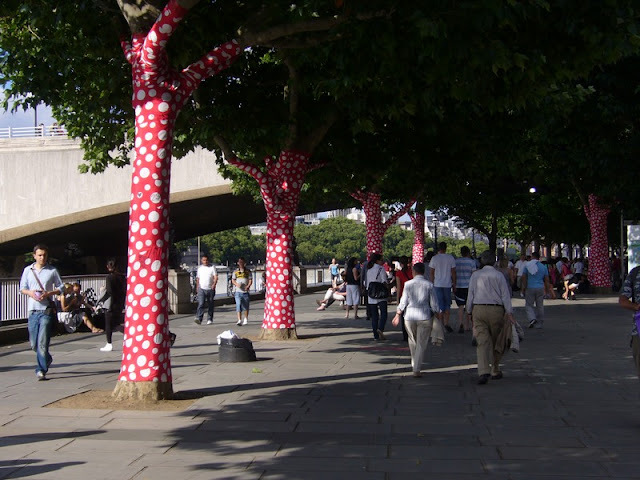 This was an initiative by the Japanese artist Yayoi Kusama linked with an exhibition in the Hayward Gallery. And why not? No trees were harmed in this little folly! 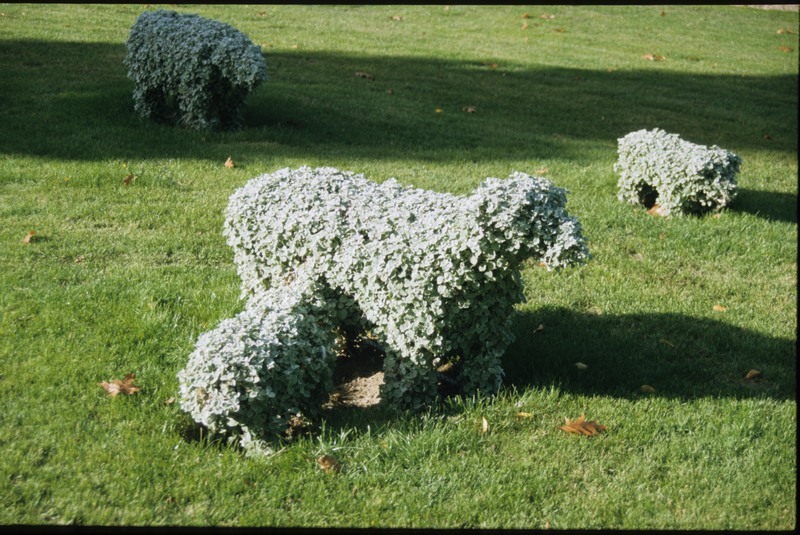 Many years ago I discovered a small flock of sheep quietly nibbling the grass in a French park. Closer inspection revealed that these were constructed from wire netting frames, planted with trimmed Helichryssum petiolare. Grow your own sheep? Is it horticulture, is it art – who knows – but if its fun and enriches the experience in our gardens, for us and our friends and visitors, then why not! Well that’s about it, so I’m off to buy myself a 19C German garden figurine with a beard and a fishing rod - or is that a gnome? A great post Ian! Humour may be the subject but you can tell the careful thought and preparation in writing this post.